Paul T. Hill examines the real-world factors that can complicate, delay, and in some instances interfere with the positive cause-and-effect relationships identified by the theories behind school choice. 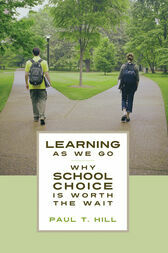 He explains why schools of choice haven't yet achieved a broader appeal and suggests more realistic expectations about timing and a more complete understanding of what must be done to make choice work. Paul T. Hill is a distinguished visiting fellow at the Hoover Institution and a member of the Koret Task Force on K-12 Education. He is the John and Marguerite Corbally Professor and director of the Center on Reinventing Public Education at the University of Washington-Bothell.